Since having Leo, I have been the proud owner of the Mothercare Spin, as the name suggests, the Spin can be turned to either face the parent for the much desired interaction or out into the excitement of the baby’s new world. The one hand spin mechanism to transfer the seat from forward to parent-facing mode makes this a easy transfer from either preference, and you can even do this while the baby is still seated! It is a lovely touch to have the rain cover and cosy toes included in the price because more often than not you have to buy them separately for other pushchairs. The Spin is easy to build, I found the instructions quite clear to follow. 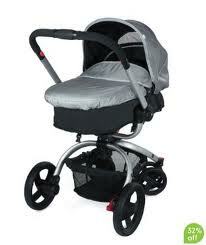 To fold down the pushchair you remove the seat and pull two clips to fold down the chassis. Both pieces are very light. To put the pushchair together you just open up the chassis and clip the seat back into place. I used this travel system from newborn, and my son was very comfortable in pram mode, he had plenty of room to stretch out and was quite happy in it until he was about 4 months old. There was still plenty of room in pram mode, but Leo had decided that the time was right for us to convert it into the pushchair. He made this very apparent! Pushchair mode is fantastic and the pram bed converts into the seat for Leo to sit very comfortably in. I still have Leo facing me so I can chat away to him when we are out and about, and he is coming up for 7 months old no! For me this is the best bit. I love being able to have him face me still, as with many other pushchairs this is not a possibility after the pram is finished with. The cosytoe is really cosy. It's lined with fleece and has a thick waterproof covering which has been brilliant through out the winter months. Leo is always wrapped up in his snow suit and then tucked up into the cosytoe, and the bar across enables the cosytoe to stay up so he never ever gets cold. It has been a real blessing to have the rain cover to quickly pull out at the first sight of rain, even with this cover on, it has still been easy to access Leo, due to the zip that falls across the front. You could realistically leave this cover on at all times. We purchased the car seat to go with the Spin in order to have the complete travel system. This has made a real difference in how we do things as we can also clip the car seat on, which has been really handy if Leo is fast asleep, I will miss this feature when Leo outgrows the car seat. The only downfalls I feel the Spin has is that the chassis seat is relatively small, Leo sits comfortably in it but I am sure if there was a bit more seat space for him it would make his journeys a bit more luxurious. The age range for this pushchair is guided by a weight restriction up to 15kg. 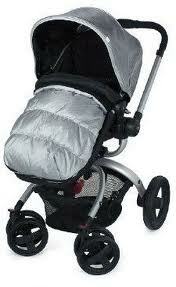 This pushchair is very easy to push with one hand (something I do quite a bit) and is nifty around shopping aisles. Although I have to say I personally find the fact that the front wheels are more streamlined a bit of a mission when it comes to judging spaces to fit through, as the back wheels are more protruding, and you may think you have squeezed through…..until you get caught by the back wheels and have to find a more suitable space to position yourself through. I have lost track of the times people have told me I need ‘L’ Plates when I have misjudged a space….but I do like to put this down to the back wheels! We have taken the Spin on many a walk, all be it on gravel tracks but it has served it’s purpose, however it did not take well to the sandy beach in Tenerife! It's definitely more 'urban' in my mind - both for looks and design. Over all I have been very impressed with the Mothercare Spin and I would definitely recommend this to other mums. I stand by my original choice of pushchair and think it has really made life easier over the last 7 months, although I do think at some point I will invest in a Stroller as Leo is growing very quickly! Hey! Do yyou know if they make aany plugins to safeguard ayainst hackers?